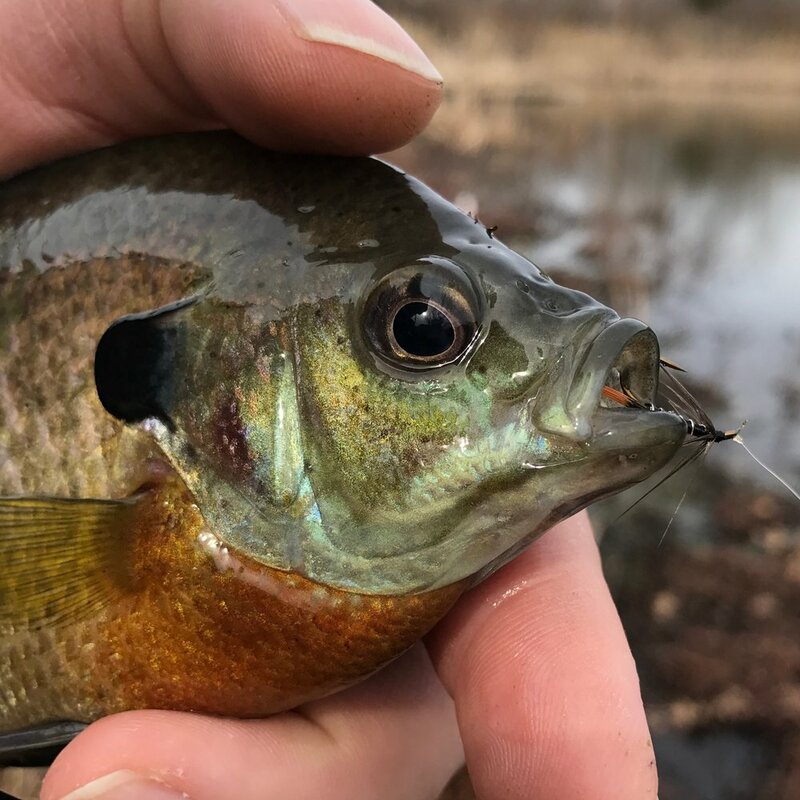 As I have mentioned many times in the past, I am a wet fly fanatic when it comes to panfish. In late winter/early spring I seldom fish anything else. An old favorite of mine is the Pennell Wet Fly. If you are a long time reader of this blog, the name may sound familiar. I have mentioned this pattern in the past. If you are interested in trying it for yourself, the pattern recipe can be found in the wet fly section of the Pattern Page. This season, like many in the past, it is the Pennell Wet Fly I am apt to select from my box more than any other wet fly or soft hackle. Granted I have a lot of confidence in the pattern because I have been fishing it so long, but it is mostly because it catches fish. A trio of Pennell Wet Flies (the single feather version). I tie two basic versions of this fly: a traditional Pennell Wet Fly and a one feather version. The conventional version is more or less a standard Black Pennell Wet Fly. It is a tried and true favorite, and I tie it as I was shown many years ago. The traditional Black Pennell Wet Fly. The second version, the Single Feather Pennell Wet Fly, is the one I take a few liberties with. I vary the colors of the body and the hackle on this fly and tie it in a range of colors. The Single Feather Pennell Wet Fly is created by using one feather for the tail and the hackle. The tip of the feather is tied down as the tail; then the feather is lashed to the shank of the hook and covered with a thin layer of dubbing. At the eye of the hook, the remaining feather is wrapped several times around the hook to make a hackle collar. Tie the feather off, cut it loose, form a small head of thread and your done. I use many different hackles for this fly, but my favorite is grizzly both natural and dyed. The Single Feather Pennell Wet fly can be tied in a variety of colors. One of the things I love about this pattern is its versatility. Later in the year when the fish are looking up for their next meal, I often fish this pattern as a dry. 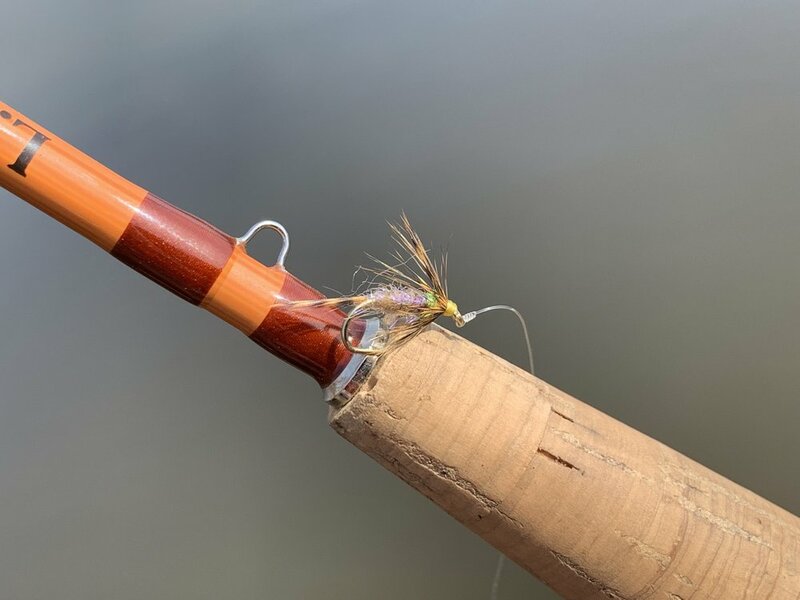 A few quick false casts will dry the fly off, and it will float like a traditional dry fly. If nothing grabs it off the surface, a little tug will submerge it, and I then retrieve it back like a wet fly. I love a fly that pulls double duty! The past week I managed to get out on the water a few times during some mild weather. 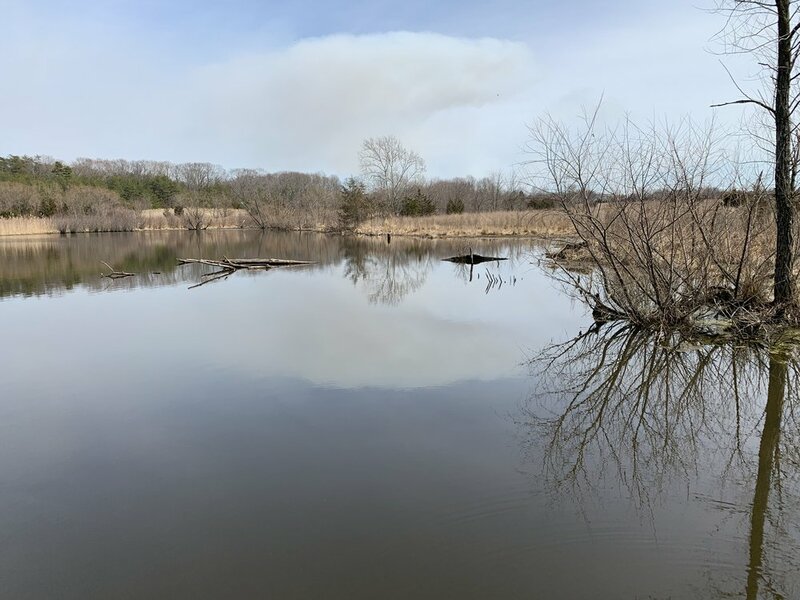 On the first day, there was a bit of wind, and the fish were found in deeper water just within reach of a long cast. Using an intermediate line, wet flies, brought in with a slow, hand twist retrieve, took a fish every few casts. Hits were tough to detect at times, but the action was pretty steady. The Black Pennell was the clear winner that day. These are the conditions I am looking for in late winter. A bright sunny day with no wind. You will often find fish basking in the warmth of the sun in shallow water. The next day the conditions had changed a bit. The daytime high was a few degrees warmer, and there was no wind. As I approached the pond, I spooked fish that were lying in just inches of water soaking up all that warmth the sun was giving them. On this day the fish were much more active. I noticed a relatively large light colored chironomid (midge) on the surface of the water. A quick look around revealed a few more out and about. While I never saw a fish rise, I decided to try a light colored Single Feather Pennell Wet Fly. While nothing rose to take the fly off the surface, I received some violent, slashing hits just as the fly was pulled under the surface. Unlike the day before when the fly had to be dragged through the depths to catch a fish, these fish were up near the surface. It was not precisely dry fly fishing, but it was close enough. You were able to see the takes as the fish rolled on the fly just under the surface. There was no mistaking the grab! One of many fish taken on a light colored Single Feather Pennell Wet Fly. 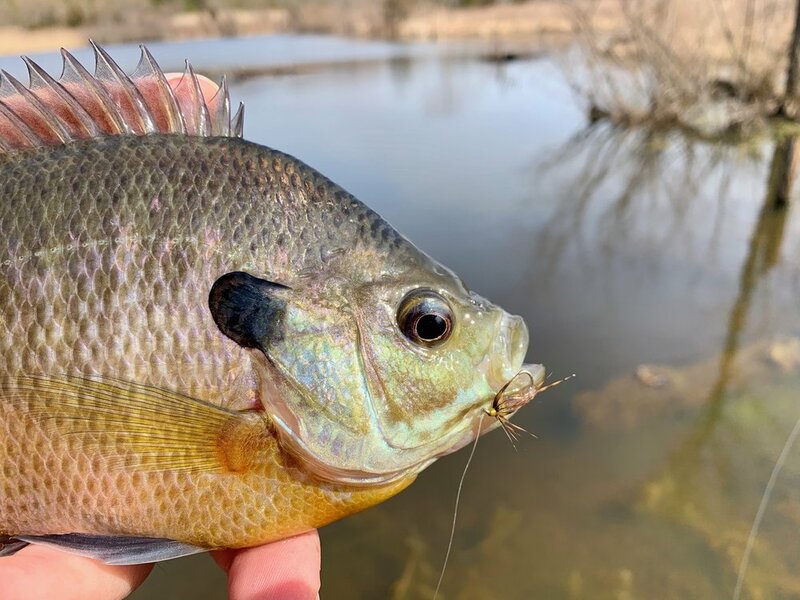 This fish grabbed the fly the moment it was pulled beneath the surface! Even Golden Shiners could not resist the charms of the Pennell Wet Fly! If you have never tried this pattern give it a go. While you're at it throw a few in your trout wet fly box as well, they are pretty fond of them also! If you want to learn more about this pattern use the search bar on the Home Page. 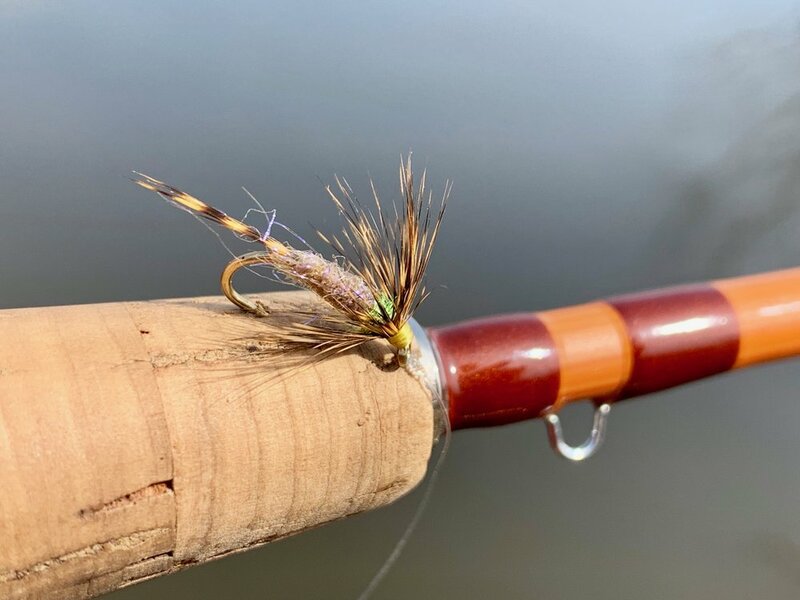 Search “Pennell Wet” to find a past post and the tying recipe for this fantastic wet fly.